After first watching the band perform at On The Rox in Hollywood following A&R Worldwide's The Ting Tings label showcase (September 2007), A&R Worldwide took immediate interest in the duo. 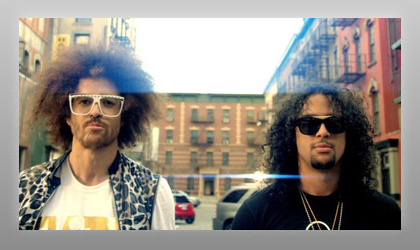 Following LMFAO's performance, A&R Worldwide met with Red Foo and Sky Blu multiple times at the A&R Worldwide offices and consulted and advised them to focus their attention to the U.K. and European markets. A&R Worldwide also helped the duo garner their first ever radio support in the world. A&R Worldwide's efforts also led to the duo being offered their first-ever deal with Polydor Records U.K. in December 2007, but LMFAO decided to wait on signing the deal. Through A&R Worldwide's and Nick Shymansky (UMG) support back in 2007, LMFAO secured their very first publishing deal with the U.K.-based This Is Global, whom A&R Worldwide and Nick Shymanksy introduced to LMFAO. LMFAO also performed at A&R Worldwide's MUSEXPO 2008, which evolved into their eventual signing with Cherry Tree/Interscope.